General George Washington knew exactly what he was about, in the summer of 1781, by trying to convince the British and his own soldiers that he would attack New York City. Unbeknownst to all, but trusted officials, he had agreed to move with the French Army south to Virginia. In Virginia, a French naval force from the Caribbean would join them to complete the encirclement of the British Army at Yorktown.ВThe soldiers of the 2nd and 3rd Continental Artillery Regiments, encamped at New Windsor, since the previous November, spent their time assembling and training on heavy siege artillery. Without the heavy guns to batter down the fortifications of British General CornwallisвЂ™ Army at Yorktown, the decisive victory achieved there would not have been possible.В On Saturday July 28 from 7:00 to 9:00 PM costumed historians will think and act like they were the actual participants, at KnoxвЂ™s Headquarters, in New Windsor, in July 1781, making the final arrangements for the movement of the artillery to the south. The вЂњresidentsвЂќ have no knowledge of the fact that Washington wants to take them south instead of to New York. Visitors will meet few, if any, names that they recognize from history, but instead humble souls whose efforts combined with thousands of others, helped forge a nation. This type of presentation, called вЂњfirst-person living history,вЂќ has developed into a very exciting way to make history more meaningful to visitors. This technique is used at Plimoth Plantation in Massachusetts and Colonial Williamsburg, in Virginia.В For more information please call (845) 561-1765 ext. 22. KnoxвЂ™s Headquarters is at 289 Forge Hill Road, in Vails Gate, New York at the intersection of Route 94 and Forge Hill Road, four miles east of Stewart Airport and three miles from the intersection of I-87 and I-84.Photo:В New Windsor Cantonment Staff in Front of KnoxвЂ™s Headquarters, the John Ellison House (provided). 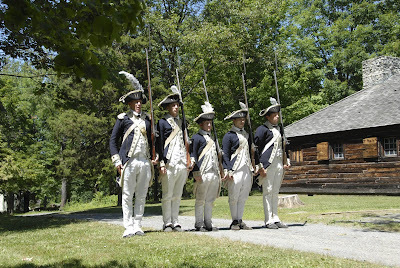 The New Windsor Cantonment and Knox’s Headquarters present a day of Revolutionary War activities. At New Windsor Cantonment, see a military drill and cannon firing at 2:00 PM, as well as blacksmithing and children’s activities throughout the day. At Knox’s Headquarters, tour the 1754 Ellison House, the military command post for three generals. New Windsor Cantonment is open Monday July 4 10:00 A.M. &#8211 5:00 P.M. At Knox’s Headquarters see a small cannon fired at 12:00 & 4:00 PM. The house is open for tours at 11:00 AM & 3:00 PM. On the 4th, at 3:00 P.M., New Windsor Cantonment invites visitors to help read the Declaration of Independence, the revolutionary document that started it all. Following the reading, the 7th Massachusetts Regiment will fire a &#8220feu-de-joie,&#8221 a ceremonial firing of muskets in honor of independence. Throughout the day authentically dressed soldiers and civilians will share stories of life from that exciting time. Knox’s Headquarters, the Ellison House, honors the site’s namesake General Henry Knox, Washington’s Chief of Artillery, with the firing of a 4 1/2 &#8221 bronze coehorn mortar at 12:00 P.M. and 4:00 P.M. This mortar, designed to be carried by two men, fired a grenade size exploding ball. John and Catherine Ellison were gracious hosts to three Continental Army generals at different times during the Revolutionary War. In addition to the special programs and activities, the National Purple Heart Hall of Honor and the New Windsor Cantonment Visitor Center are open. These buildings feature the history of the New Windsor Cantonment- Behind Every Great Man: The Continental Army in Winter, 1782-83, Revolutionary War artifacts, the exhibit The Last Argument of Kings, Revolutionary War Artillery and the story of the Purple Heart. A picnic grove is available and there is plenty of free parking. Just one mile from the Cantonment is Knox’s Headquarters State Historic Site. Elegantly furnished by John and Catherine Ellison, the 1754 mansion served as headquarters for Revolutionary War Generals Nathanael Greene, Henry Knox, and Horatio Gates. Also be sure to visit Washington’s Headquarters in Newburgh, a short drive from the New Windsor Cantonment. Admission is free. For more information please call New Windsor Cantonment at (845) 561-1765 ext. 22. New Windsor Cantonment is co-located with the National Purple Heart Hall of Honor on Route 300 (374 Temple Hill Road) in the Town of New Windsor, four miles east of Stewart Airport. It is three miles from the intersection of I-87 and I-84 in Newburgh, New York. Knox’s Headquarters is located, a mile away from the New Windsor Cantonment, at the intersection of Route 94 and Forge Hill Road in Vails Gate. Written at the Ellison House in early March 1783, the two letters that came to be known as the Newburgh Addresses stirred passions within the Army. The author called for the officers of the Continental Army to threaten a march on Philadelphia and use military force to compel Congress to redress their longstanding grievances. Had the conspirators been able to make good on this threat the United States, considered the beacon of freedom and democracy for the world, might have developed quite differently. Whether this threat was real or just an elaborate bluff, the implications of the letter shocked George Washington. Throughout its long troubled history the Continental Army had been kept together by its officers despite dreadful conditions, bitter defeats, and soldier mutinies. If the officer corps turned against the country, who could prevent the military from dictating to its civilian masters? Washington countered the first letter by expressing his “disapprobation of such disorderly proceedings” and directed that the officers meet in the Temple Building on March 15th to hear the latest report of the Committee of the Army to Congress. In the second letter dated March 12th, the author argued that Washington by not banning further meetings actually supported their tough rhetoric. They could not have been more wrong. Experience a dramatic reading of the events culminating with the conspiracy to force Congress to redress longstanding army grievances this Sunday March 11, 2012 at 2 PM at Knox’s Headquarters State Historic Site. Call (845) 561-1765 ext. 22 for more information or to make reservations. 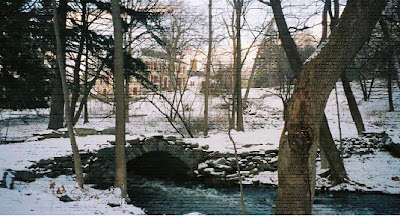 Photo: The 1754 John Ellison house, Knox’s Headquarters, viewed from the 18th century bridge over Silver Stream (provided). For two Christmases, John and Catherine Ellison shared their home with the officers and soldiers of the Continental Army. Over the winter of 1780-81, General Henry Knox, his wife Lucy and the young Henry and Lucy were there, while two years later it was General Horatio Gates and his military family of aides de camp who shared in the season’s festivities. 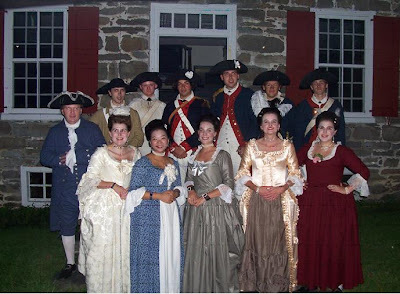 From 5:00 to 8:00 PM on Friday December 16th & Saturday December 17th tour the elegantly appointed 1754 Ellison house decorated for Christmas and staffed by Revolutionary War era costumed interpreters. On Monday December 26th, Tuesday December 27th & Wednesday December 28th Open House at Knox’s Headquarters. The Ellison mansion is open for tours at 10:00 AM, 11:00 AM, 1:00 PM & 2:00 PM each day. Tour the elegant 1754 historic house decorated for the season in 18th century fashion. Knox’s Headquarters is located at 289 Forge Hill Road, in Vails Gate, New York, three miles southeast of the intersection of I-87 and I-84. The bridge over Moodna Creek, just east of Knox’s Headquarters, was damaged by Hurricane Irene, so access to the site is from State Route 94 only. For more information please call (845) 561-1765 ext. 22. At 2:00 PM, Revolutionary War soldiers perform a military demonstration and fire a cannon. A gallery tour will follow the demonstration. From 3:30 to 4:30 PM tour the nearby 1754 Ellison House, Knox’s Headquarters. New Windsor Cantonment State Historic Site is co-located with the National Purple Heart Hall of Honor on Route 300, 374 Temple Hill Road, in New Windsor, NY, just three miles south of the intersection of I-87 and I-84. Knox’s Headquarters is located at 289 Forge Hill Road in Vails Gate, New York. For more information please call (845) 561-1765 ext. 22. When 300 soldiers from the 2nd and 3rd Continental Artillery Regiments established a winter encampment at New Windsor, New York, in November 1780, American fortunes were at their lowest ebb. The previous spring, their southern army had surrendered to British forces at Charleston, South Carolina and a second army sent from the north was routed at Camden, northwest of modern Columbia. In September, Benedict Arnold’s treason shook what little confidence Americans still had in the nation’s leadership. The alliance with France produced little, but discord, the country’s finances were in shambles and the growing number of mutinies exposed the fact that the American soldiers’ often-praised perseverance was starting to waver. When the artillerymen marched out of New Windsor, in June 1781, some of their number would assist in compelling over 8,000 British soldiers and sailors at Yorktown Virginia to surrender, in October. American joy following the victory at Yorktown was short-lived, however, because the British still controlled Maine, New York City, Wilmington, Charleston and Savannah. At the end of October 1782, the Continental Army returned to New Windsor with 7,500 soldiers. They built a city of log huts which they occupied until June 1783. American finances remained precarious. Resentful of past mistreatment and the nation’s unfulfilled promises, the officers and soldiers looked to the future with growing uncertainty. Only by a personal appeal to his officers, at New Windsor, did Washington prevent a possible mutiny. General Washington knew exactly what he was about, in the summer of 1781, by trying to convince the British and his own soldiers that he would attack New York City. Unbeknownst to all but trusted officials, he had agreed to move with the French Army south to Virginia. In Virginia, a French naval force from the Caribbean would join them to complete the encirclement of the British Army at Yorktown. The soldiers of the 2nd and 3rd Continental Artillery Regiments, encamped at New Windsor, since the previous November, spent their time assembling and training on heavy siege artillery. Without the heavy guns to batter down the fortifications of British General Cornwallis’ Army at Yorktown, the decisive victory achieved there would not have been possible. On July 24 from 7:00 to 9:00 PM costumed historians will think and act like they were the actual participants, at Knox’s Headquarters, in New Windsor, in July 1781, making the final arrangements for the movement of the artillery to the south. For more information please call (845) 561-1765 ext. 22. Knox’s Headquarters is at 289 Forge Hill Road, in Vails Gate, New Windsor, New York at the intersection of Route 94 and Forge Hill Road, four miles east of Stewart Airport and three miles from the intersection of I-87 and I-84. As the evening progresses, the masking darkness gives the grounds a surreal experience, adding significantly to the authenticity of the experience. The residents will beguile visitors with tales of past glories, suffering, and share their hopes and aspirations for an uncertain future. Tour the grounds and mansion by the glow of tin lanterns and experience the tense days before Yorktown with the soldiers and civilians, who once made their homes in the area. The “residents” have no knowledge of the fact that Washington wants to take them south instead of to New York. Visitors will meet few, if any, names that they recognize from history, but instead humble souls whose efforts combined with thousands of others, helped forge a nation. This type of presentation, called “first-person living history,” has developed into a very exciting way to make history more meaningful to visitors. This technique is used at Plimoth Plantation in Massachusetts and Colonial Williamsburg, in Virginia. Photo: New Windsor Cantonment Staff in Front of Knox’s Headquarters, the John Ellison House. Written at the John Ellison house, Knox’s Headquarters, in early March 1783, the two letters that came to be known as the Newburgh Addresses stirred passions within the Army. The author called for the officers of the Continental Army to threaten to march on Philadelphia and use military force to compel Congress to redress their longstanding grievances. Had the conspirators been able to make good on this threat, the United States, the beacon of freedom and democracy for the world might have developed quite differently. Knox’s Headquarters will present a lecture and special tour on Saturday March 12 from 1:00 – 2:30 PM highlighting this conspiracy. Whether this threat was real or just an elaborate bluff, the implications of the letter shocked Washington. Throughout its long troubled history, the officers had kept the Continental Army together despite dreadful conditions, bitter defeats and soldier mutinies. If the officer corps turned against the country who could prevent the military from dictating to its civilian masters. Washington countered the first letter by expressing his “disapprobation of such disorderly proceedings” and directed that the officers meet in the Temple Building on March 15th to hear the latest report of the Committee of the Army to Congress. In the second March 12th letter, the author argued that Washington, by not banning further meetings actually supported their tough rhetoric. They could not have been more wrong. Photo: The 1754 Ellison House, Knox’s Headquarters State Historic Site. From November 1782 to April 1783 General Horatio Gates, from this headquarters, commanded over 7,000 soldiers of the Continental Army encamped at New Windsor. In early March 1783, Gates’ aide de camp Major John Armstrong wrote the Newburgh Addresses in this house. For two Christmases, John and Catherine Ellison shared their home with the officers and soldiers of the Continental Army. Over the winter of 1780-81, General Henry Knox, his wife Lucy and the young Henry and Lucy were there, while two years later it was General Horatio Gates and his military family of aides de camp who shared in the season’s festivities. 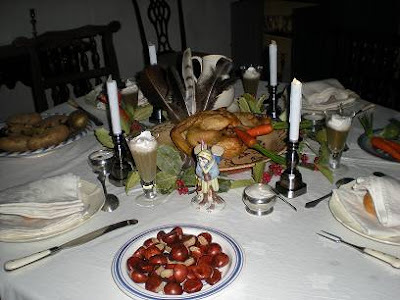 From 6:00 to 8:00 PM on December 18th tour the elegantly appointed 1754 Ellison house decorated for Christmas and staffed by Revolutionary War era costumed interpreters. For your further enjoyment the King’s Delight will play period music throughout the evening. On Monday December 27, Tuesday December 28 & Wednesday December 29 Open House at Knox’s Headquarters. The Ellison mansion is open for tours at 10:00 AM, 11:00 AM, 1:00 PM & 2:00 PM each day. Tour the elegant 1754 historic house decorated for the season in 18th century fashion. Knox’s Headquarters is located at 289 Forge Hill Road in Vails Gate, at the corner of Route 94 and Forge Hill Road, just three miles south of the intersection of I-87 and I-84. For more information please call (845) 561-1765 ext. 22. Don’t tell the folks at Knox’s Headquarters State Historic Site where he held court as the Revolutionary War came to an end, but no one really cares about Henry Knox. It’s not that we shouldn’t, it’s just that we don’t &#8211 don’t have the stomach for it. It’s mostly Knox’s own fault, he was kind of a jerk who lived opulently after his retirement in Maine where he hoped to exploit a retinue of labors and craftsmen in shipbuilding, brick-making, and cattle-raising. His neighbors came to despise him, rejected his leadership, threatened to burn him out, and tore down his mansion after his death. Knox’s Maine estate, Montpelier, was the center-piece of his million acre holdings &#8211 an empire acquired through graft and corruption. Once a right-hand man of General George Washington who later served as the nation’s first Secretary of War, Knox was so unpopular in his later years that local settlers armed themselves and threatened to burn his home to the ground and voted him out of office (electing a local blacksmith in his place). Unfortunately, Mark Puls’s Henry Knox: Visionary General of the American Revolution ignores these details and instead paints an all-too-friendly portrait of the man who served as a model for Col. Pynchon in Nathanial Hawthorne’s The House of the Seven Gables. 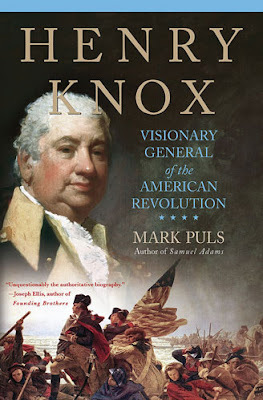 Puls’s Henry Knox is just a simple hero and the basic outline of his career is rehashed as a central figure in the American Revolution. &#8220In many instances,&#8221 Puls writes,&#8221 Washington depended on Knox to save the army, and in doing so, he placed the fate of the country in his hands.&#8221 Perhaps this is just the value of Puls narrative, to remind us that there were others who participated in the the revolution that established a new government here in America. But serious students of history want more, a fuller picture of a complicated man. For example, it’s inconceivable that any treatment of Henry Knox can leave out Joseph Plumb Martin. Martin joined the Revolution in 1776 as a Private and was eventually made a Sargent. Compared to Knox, he was a relatively obscure man during his life. After the war he spent some time as a teacher in New York and then settled in Maine where he was elected Selectman, Justice of the Peace, and for more than 25 years, Town Clerk. Martin’s popularity with his neighbors isn’t the only thing that separates him from Henry Knox. There was also that time Henry Knox drove him from his 100 acres. Henry Knox’s encounter with Joseph Plumb Martin (and his other neighbors) might have not come to light at all had it not been for the work of more serious historians and Joseph Plumb Martin himself. His narrative A narrative of some of the adventures, dangers, and sufferings of a Revolutionary soldier, interspersed with anecdotes of incidents that occurred within his own observation, published anonymously in 1830 and rediscovered by the general public in the 1960s, has become a central primary source for the American Revolution. Puls certainly must have known about it, and recognized Henry Knox’s role in the life of his fellow patriot. Henry Knox didn’t bother to respond to that request and Joseph Plumb Martin lost his farm. In what might be considered a fitting twist of fate, Knox’s businesses failed and he was forced to sell his holdings to pay his debts. Knox coked on a chicken bone a few years later in 1806 and was a burden no more to the people of Maine. When his widow died Knox’s grand mansion was neglected and torn down for a railroad right-of-way. In the nativist revival of the 1920&#8242-s, a local Daughters of the American Revolution chapter organized to rebuild the Knox home. In a way not unlike Mark Puls’s sprucing-up of the old General’s career, the rebuilt Knox home was made of concrete block &#8211 sturdier than it ever was in real life. Mark Puls is the author of Samuel Adams: Father of the American Revolution, winner of the Fraunces Tavern Museum Book Award, and co-author of Uncommon Valor: A Story of Race, Patriotism, and Glory in the Final Battles of the Civil War with Pulitzer Prize winning journalist Melvin Claxton. Puls has worked as a journalist for The Detroit News. He lives in Hawntranck, MI. 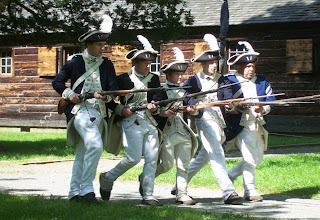 The New Windsor Cantonment and Knox’s Headquarters will present a weekend filled with Revolutionary War activities July 3rd and 4th, 2010. Throughout the celebration, authentically dressed soldiers and civilians will share stories of life from that exciting time. In addition, at the New Windsor Cantonment, there will be cannon and musket firings each day at 2:00 P.M. as well as blacksmithing and children’s activities. At Knox’s Headquarters, visitors may tour the beautiful 1754 Ellison House and watch as a small cannon is fired at 1:30 P.M. and 3:30 P.M. each day. On the 4th, at 3:00 P.M., New Windsor Cantonment invites the audience to help read the Declaration of Independence, the revolutionary document that inspired the holiday. Following the reading, the 7th Massachusetts Regiment will fire a &#8220feu-de-joie,&#8221 a ceremonial firing of muskets in honor of independence. Knox’s Headquarters, the Ellison House, honors the site’s namesake General Henry Knox, Washington’s Chief of Artillery, with the firing of a 4 1/2 &#8221 bronze coehorn mortar at 1:30 P.M. and 3:30 P.M on Saturday July 3 and Sunday July 4. This mortar, designed to be carried by two men, fired a grenade size exploding ball. John and Catherine Ellison were gracious hosts to three Continental Army generals at different times during the Revolutionary War. Both New Windsor Cantonment and Knox’s Headquarters will be open Saturday July 3rd, 10:00 A.M. &#8211 5:00 P.M. and Sunday July 4th, 1:00 P.M. &#8211 5:00 P.M.
For more information, please call New Windsor Cantonment at (845) 561-1765 or Knox’s Headquarters at (845) 561-5498. New Windsor Cantonment is located with the National Purple Heart Hall of Honor on Route 300 (374 Temple Hill Road) in the Town of New Windsor, four miles east of Stewart Airport. It is three miles from the intersection of I-87 and I-84 in Newburgh, New York. Knox’s Headquarters is located, a mile away from the New Windsor Cantonment, at the intersection of Route 94 and Forge Hill Road in Vails Gate.